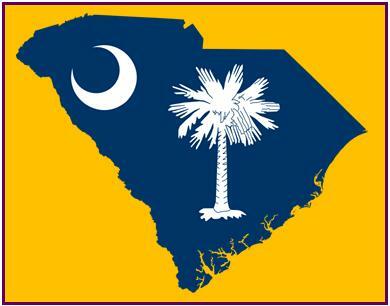 Note: An advisory committee member, a Caterpillar Tractor plant, has purchased 100 Gas Saver Systems. In 2018 they added 20 more welding machines and bought 20 more; in 2019 another 20! Help Your School Reduce Waste and Save Money! The Many Short Welds and Tack Welds Made in Welding Schools Allow Our Gas Saver System to Reduce Gas Use by Over 50% with Improved Weld Starts! All 61 MIG welders had GSS's installed. They simply replaced the old gas delivery hoses. 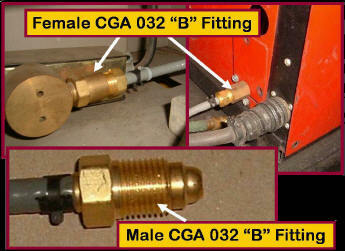 The majority of the wire feeders and welders in the school have standard Compressed Gas Association female inert gas fittings (CGA 032; "B".) Our standard GSS hose (FB3, FB4, FB6 etc.) comes with male CGA 032 "B" fittings preinstalled on both ends (Note, one end has our peak flow limiting orifice and is labled as such.) All that is required is to simply unscrew the original gas delivery hose from the gas cylinder regulator/flowmeter or a flow control with two gauges, one labled CFH, to the feeder/welder and screwing in the GSS. See below for a few welders that needed different fittings. Some welders at FDTC had a 1/4 inch hose coming from inside the combined Power /Feeder welder. 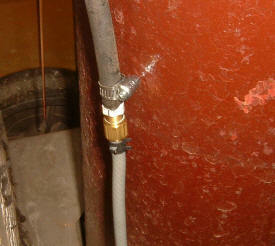 The gas delivery hose was attached to a barb fitting on the gas solenoid inside the welder. For these units it was a simple matter to cut the original gas hose close to the outside of the welder and use our WAT Splice Connector to install the GSS. As with standard "B" fittings, a surge flow restrictor is built into the Splice fitting. Note we typically supply Splice Fittings for GSS's used on welders and regulator gas controls produced outside the US that often employ a simple hose barb connection. A GSS can be supplied with a CGA fitting on the Gas Supply end and a splice fitting on the Welder end, or visa versa if needed. Welders or Students Setting Shielding Gas Flow to High? We have measured 150 CFH when the ball is pinned to the top of the flow tube with some regulator/flowmeters! 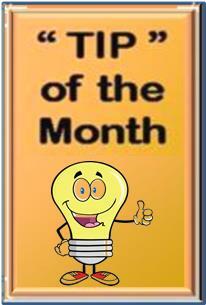 Save Gas and Avoid Excess Gas Flow Pulling Air Into The Shielding Stream. Click on Photo Left for More Information. OPERATE A WELDING SCHOOL OR WELD TRAINING FACILITY? Great Idea - from a welding school instructor. Welds made at these locations are of short duration and include many tack welds. The start surge wastes a great deal of shielding gas. Shielding gas savings can easily exceed 50%. Also, even though duty cycle is low, many cylinders are rented. 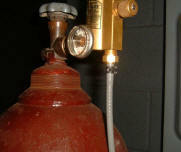 Since the gas usage is significantly reduced with the Gas Saver System (GSSTM) a school can get by with fewer cylinders. Simply put two welders on one cylinder and reduce the rental bill ! Super Simple! 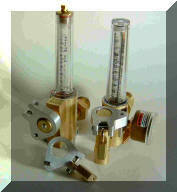 -Dual regulator flowmeters are often used when a back purge gas line is emplyed. See photo left. Just connect two GSS's to the two outlets and save cylinder rent! Flows can be set independently. You'll be changing cylinders no more frequently than at present. Concerned that students are setting too high? Our Flow Rate Limiter will fit this model! Questions about what Dual Regulator/Flowmeter to purchase? Thank you for the wonderful book that you wrote. The content is possibly one of the best written and cogently assembled pieces of welding instruction that I've ever read. I have literally dozens of books on welding that span a good 5 or 6 decades. Some of the better ones were written back in the 40's for training the wartime workers. It's amazing to me that it took over 60 years for a book to be published that is comprehensive and comprehendible that explains in everyday language, the latest techniques in the welding arts and sciences. The coverage of the subject was more complete than I have ever seen. This is a classic, and sure to be a benchmark reference book for years to come. 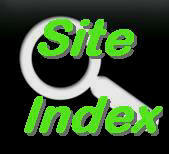 I have recommended the book to my membership at the website and continue to promote it wherever I go. 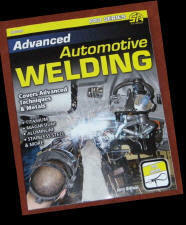 I know that ADVANCED AUTOMOTIVE WELDING will be a huge success, and we are honored to have been a small part of it. Please don't hesitate to call if there is every anything that we can do for you. 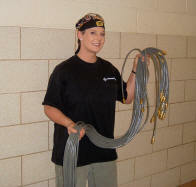 FOR WELDING SCHOOLS--Need a way to purchase pro duct other than Credit Card for your school or weld training facility? Need to issue a Purchase Order? Please E-mail.